Some rags-to-riches stories, especially in Internet marketing, have the whiff of b.s. to them. My friend Tim Verdouw, whom some of you know from Facebook, just released an excellent new training program for a mere $7. 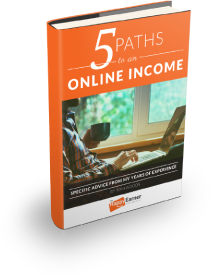 It shows the exact, step-by-step method he uses to make his online living promoting other people’s products and earning commissions. I went through it myself. Yes, it works — I see Tim doing precisely this every day. And the tools and strategies you learn will serve you well in whatever you do online. First, a program called Laptop Legacy, by Bill Hugall. I just wished Bill a happy 39th birthday a few days ago. He’s on top of the world, and very successful. It wasn’t always so: Bill used to be homeless. He doesn’t blame the world for this; he’ll tell you straight out that he made plenty of bad decisions. In fact, in his Facebook video this week, Bill said that in the old days nobody would have given him the time of day, or ever expected he was going anywhere with his life. What’s Bill’s secret? That’s what his Laptop Legacy program is about, and that, too, is a free bonus when you grab Tim’s $7 product through the link below. My second bonus is a program I sold last year, but am now giving away for free: List Masteree, in which half a dozen established folks explain how they built their email lists — which, though you may not believe me now, will one day be your most prized asset — and how they monetize them. This is gold.